Barnsley's latest War Memorial is to be dedicated on Friday 6th November at 11am. The following report by Paul Whitehouse was published in the Penistone edition Barnsley Chronicle on 30th November. We have reproduced it here for the benefit of the rest of Barnsley and people in a wider area who may be interested to attend this historic event. "The final sections of the new Gunthwaite and Ingbirchworth war memorial are expected to go into position on Sunday [1st November]. They will be put into place ahead of a service of dedication to be conducted next Friday morning before the first Remembrance Sunday service to held there two days later. It is the culmination of a long-term project by Gunthwaite and Inbirchworth Parish Council, which has leased the site on Wellthorne Avenue from Barnsley Council for 125 years at a peppercorn rent. The Rev Ann Sykes will conduct the dedication service at 11am, with Fr David Stocker expected to conduct the Armistice Sunday service. 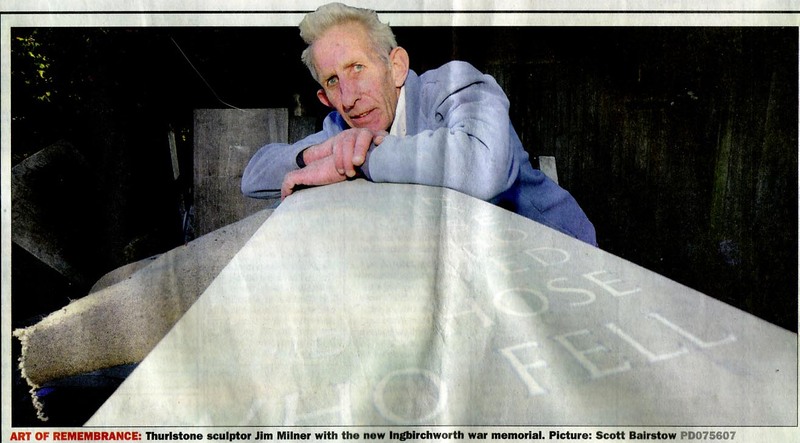 He is the father of Elizabeth Stocker, who has worked on the project, helping to put the lettering on the memorial. She has been involved alongside Thurlstone sculptor Jim Milner and stone mason Dave Bedford. Parish Council chairman Charles Coupe said the project had been given much time by Tony Whitbread, Keith Batley and David Edmonson, who are all parish councillors, with support from elsewhere in the community including Marshall's quarry which donated some stone and Ged Parker, a farmer and roofing contractor who has used his equipment to help with the project. It has also been supported with a grant via Barnsley Council." This will not be the first war memorial in Ingbirchworth though! In August 2014 we were told about the two Rolls of Honour from Ingbirchworth Methodist Church which had been rescued by Arthur Holmes, whose late wife Marlene had been the church's secretary. The Rolls of Honour, one from World War One with 55 names and the other from World War Two with 17 names, are displayed in Arthur's shop on Wellthorne Lane. Follow our links to see photographs and the lists of names on these memorials.